Dehold Atu was born on Bajor in the year 2354 during the Cardassian Occupation. Due to the conditions in which the Bajorans were kept on Bajor Atu's father died of a disease that went undiagnosed and untreated. This prompted her to want a career in medicine. She wanted to help people and try to prevent a child from losing a parent the way she did. 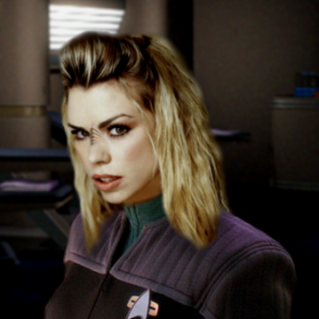 At the age of seventeen she left Bajor and entered Starfleet Medical Academy to become a Doctor. Her early years at the Academy were difficult especially academically. She never failed any courses and she bounced back cracking the top forty percentile of her graduating class. She was originally assigned to the USS Intrepid but an opening on the Curie caused Atu to forego the rest of her leave to report in early as the ship's Assistant Chief Medical Officer for the trip to the Delta Quadrant.